Imagine a nation where everyone is well – in mental, social and spiritual health. Now imagine you’re actually in a position to help make that dream a reality. 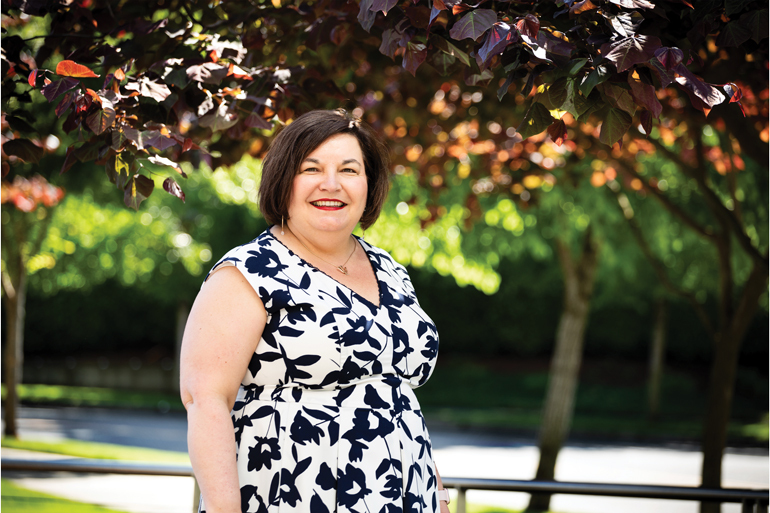 That’s exactly the role George Fox alumna Robin Henderson (MA94, PsyD96) has taken on as one of the executives of the Well Being Trust, launched in 2016 by nonprofit healthcare giant Providence St. Joseph Health with startup funding of $130 million. Henderson, who serves as clinical liaison for the trust, helps decide what projects are approved to go forward, providing oversight for both investment and programming. The goal of the trust is to help transform national healthcare so that it treats patients from a more comprehensive perspective, not viewing disease, mental illness and substance misuse as single occurrences but rather as elements of a complex set of factors that determine a person’s overall wellbeing. “I am excited because it embraces the role that foundations can play in advancing policy and community-driven solutions for health and wellbeing,” she says of her role. For Henderson, the trust is just a part of her job as chief executive of behavioral health for Providence Medical Group. Working out of the organization’s downtown Portland headquarters since 2016, she is responsible for all things mental health and substance use within Providence Oregon. She also has a “dotted line” relationship to Providence Health Plan in addition to her role as co-chair of the Providence St. Joseph Mental Health and Substance Use Clinical Performance Group, a system-wide initiative focused on improving clinical care. With four direct reports and hundreds of employees reporting to them, Henderson says her average day consists of a lot of meetings – some onsite, many virtual, and some in the community. “I spend a lot of time working with teams of folks who are carrying out their own initiatives, and work hard to integrate them together so we have an effective system,” she says. A recent day had eight back-to-back meetings. But despite the long hours, the George Fox graduate says she feels a great sense of purpose in her work. Her calling also includes current or past involvements with 11 external boards and 17 committees in Oregon, including serving as president of the Oregon Psychological Association. Henderson says her current roles are not what she had in mind when enrolling in the George Fox Doctor of Psychology program. At that time she was focused on a career in clinical practice. But her friends, she says, would be quick to point out that since she was a teenager she wanted to be a hospital CEO – “just like Dr. Hardy on ‘General Hospital,’” she laughs.